Agents of the Iranian regime’s Ministry of Intelligence and Security arrested three Christian men in the Esfahan province last week. Messrs. Shahram Ghaedi, Heshmat Shfiei and Emad Haqi were arrested on September 27 in the city of Fooladshahr. MOIS agents raided the home of Mr. Sharam Ghaedi at 6:30 pm. They searched his home and confiscated his personal items before detaining him. 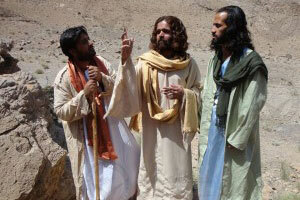 Shahram Ghaedi, an actor, was making a movie about the life of Jesus Christ. There is no information on the whereabouts of the three arrested Christians in Iran. Last year Hassan Rouhani became the president of the clerical regime in Iran beside the political opposition, ethnic minorities, including Kurds, Arabs, and Baluchis and religious minorities, including Christians, who have suffered from the violence of the regime. Christians have been detained and sentenced to long-term imprisonment and exile, many without access to a lawyer or a fair trial. Last week the Iranian regime’s judiciary officially charged three Iranian pastors for “acting against national security” and “association with the aim to overthrow the system” (the Iranian regime). Pastors Behnam Irani, Matthias Haghnejad and Deacon Silas Rabbani were charged at the so-called 1st Branch of the Revolutionary Court on Tuesday in city of Karaj. Pastor Haghnejad, Pastor Irani and Deacon Rabbani, who are being held separately in Ghezal Hesar Prison, were recently charged with ‘Mofsed-e-filarz’, or ‘spreading corruption on earth’, which carries the death sentence. Mervyn Thomas, Chief Executive of Christian Solidarity Worldwide said: “It is completely unacceptable that they have faced trial once again on unwarranted charges and that their unjust prison terms may be extended even further,” BosNewsLife reported. “Some in the West are calling for renewed relations with Iran in the face of the threat posed in Iraq and Syria by [Islamic State] ISIL [militants]. However, it is worth noting that Mr Amir-Aslani was one of six people executed on the same day that the British Prime Minister met with President Rouhani at the United Nations,” Thomas said.